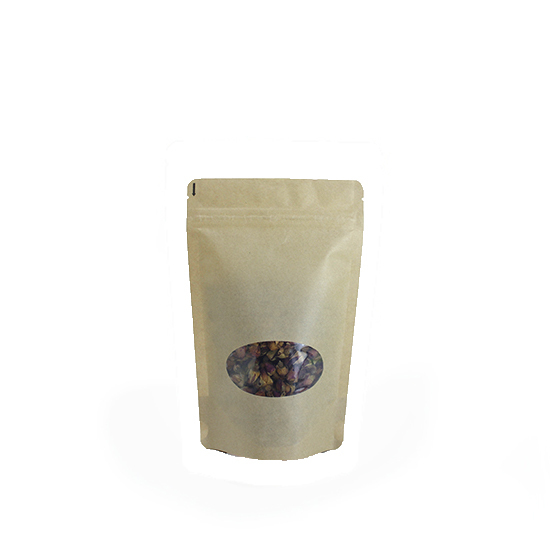 Packing your teas in a small sized bag? 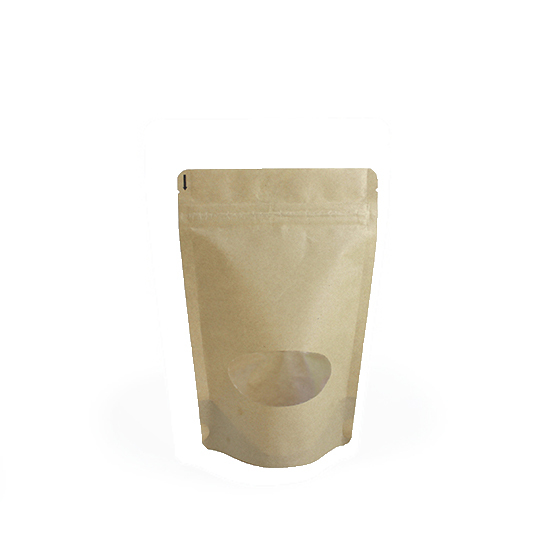 Check out our 2 oz size Kraft paper bags. 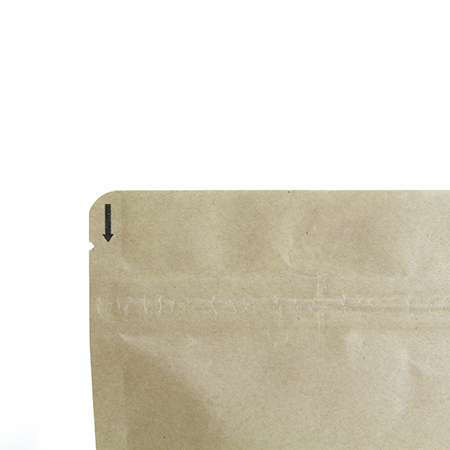 These bags are made with a resealable zipper and a tear notch for easy opening. 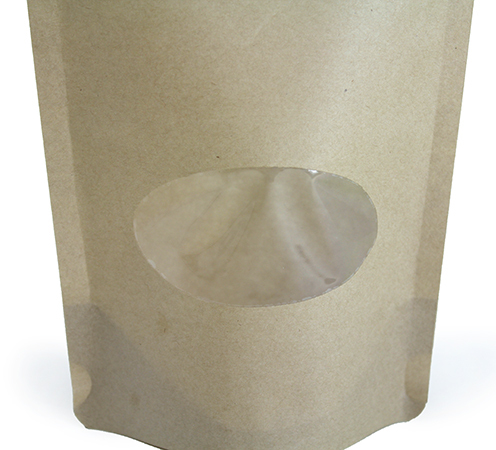 This Kraft paper bag uses less plastic for a friendlier environment. Pre-pack these for your online store, or prep them up for the storefront. Not sure this is the bag for your product? 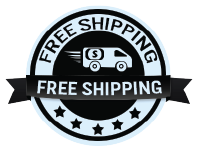 Feel free to request a sample by adding one piece to your shopping cart today! Love this windowed kraft bag. Opening is large enough for filling, window is large enough to see the contents. Love that these bags are heat sealable. Great bag at a wonderful price, just what we needed. Looks nice with our Red Red Coffee Toffee. Q: Hi, would like to know what kind of barrier this pouch comes with? Thanks! A: There are 4 layers in total for a high level barrier. It has Kraft Paper, PET (Polyethylene terephthalate), PET (Polyethylene terephthalate), and PE (Polyethylene). Q: Is the only way to seal this bag is heat seal? Would we need a heat sealer for these bags. Do you have a 2oz bag with window that does not need to be heat sealed? A: Technically, you do not need a heat sealer due to the fact that our Stand Up Pouches all have a reusable zipper. In order to make the bag tamper-proof, that is when you would need to use the heat sealer to make sure no one is tampering with the contents inside the bag. Q: What would be the price if I order more than 10 cases? Thank u! A: Call our office to discuss what quantity you would be interested in. Online we usually offer three discount points. On this item we display split case pricing, 1-4 cases, and 5-9 cases. Our office number is 909-923-9588 and ask for George in Sales.